Our O-Rings are specially manufactured for both static and dynamic applications and offer a wide range of properties, including excellent compression set characteristics, ability to withstand aggressive process media, and a long trouble-free operating life. 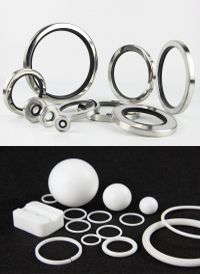 DKI's high performance o-rings are available in a variety of advanced materials, in both standard and custom sizes. The Rotary Shaft Seal also known as an oil seal, shaft seal, lip seal. At DKI, utilizing comprehensive design and manufacturing technology, we endeavor to provide every customer with high quality and performance Oil Seals. Whatever your sealing requirements, DKI has the means to exceed your expectations. DKI can offer a wide range of PTFE compounds for applications requiring minimum friction, wide temperature range and maximum media resistance. Our range includes Virgin PTFE and mixes of carbon, graphite, glass, bronze, mos2 and nickel filled PTFE compounds. DKI hydraulic seals are produced in a variety of designs and materials to meet the today’s industry challenging applications. Hydraulic Seals are intended to be used in hydraulic cylinders with reciprocating movements. The main tasks of hydraulic seals are to retain hydraulic fluids, to exclude solid or liquid contaminations and to maintain the hydraulic pressure. At DKI Rubber & Plastic Ltd, we design and manufacture a variety of custom molded rubber seals and molded rubber components for across a wide range of applications and industries. All of our molded rubber seals and components are custom designed for your application enabling us to meet almost any specification. We have the ability to fabricate all types of machined plastics. We routinely machine parts form plastic sheet, rod and tube. Our Machined Parts range from simple rings to intricate shapes and complex assemblies. Our CNC Machining, milling, drilling and cutting capabilities, for all your plastic precision cutting requirement.